Ind. loc. : "Nord-China [China / 中华]: Kansu [Gansu / 甘肃省] septentrional, bei Wei tschou [Lanzhou / Lan-Tcheou? ], am 7. Juni 1918 (R. P. Licent n. 3845; in Herb. mus. Paris)" (Beck, 1930: 38). Holotypus / Holotype: 1. "3845 / Kansou [Gansu / 甘肃省, Nord-China (China / 中华)] septentrional / Wei tschou [Lanzhou / Lan-Tcheou?] / 7-VI-1918 [leg. R.P. Licent]". – 2. "Cistanche sinensis n. sp. / 20.XII.1928 Beck [m. Beck] / R.P. Licent. — Chine Septentrionale. / Reçu le 24 Août 1922". – 3. "det.-rev. Ataei 05-2014" (P 02983456). 1. "Herbarium Kewense / Northern China / Nº 3845 / cis / Cystanche sp. / Wei tschou [Lanzhou / Lan-Tcheou?] / Kansou [Gansu / 甘肃省, Nord-China (China / 中华)] Septenl / 7.6.18 / Coll. Abbe E. Licent]". – 2. "Cistanche salsa (C.A. Mey.) G. Beck / Det. N. Ataei 2012.02.03". – 3. "isotype / of Cistanche sinensis Beck / in Engl., Pflanzenr. IV: 261 (Heft 96): 38 (1930)". – 4. "Molecular (DNA), Organ: Leaf, flower, DNA Bank number: 42129, Taken by: Crawford, Dept. : Herbarium, Date: 19.4.2012" (K 000852791, isotype). Designated by: Beck in Engl., Pflanzenr. 96: 38 (1930). Host: Parasitic on Chenopodiaceae species (e.g., Caroxylon passerinum (Bunge) Akhani & Roalson [Salsola passerina Bunge]), Tamaricaceae sp. (e.g., Reaumuria songarica (Pall.) Maxim. [Tamarix songarica Pall. ]), Fabaceae (e.g., Ammopiptanthus mongolicus (Kom.) S.H. Cheng, Caragana tibetica Kom. ), Zygophyllaceae (e.g., Zygophyllum xanthoxylon (Bunge) Maxim., Tetraena mongolica Maxim.) and Rosaceae (Potaninia mongolica Maxim.) (Xin, 1992: 191; CVH [FRPS 69: 84]; frps.iplant.cn C.sinensis). The host plants need to be confirmed by further studies. Comments: Peng & Wang, 1996: 94 t. 67 f. 1-3 (C. sinensis) vs. 1996: 95 t. 68 f. 1-7 (C. lanzhouensis [C. ningxiaensis]). "Calyx 5-parted, lobes unequal; corolla lobes pale brown-yellow when dry (C. lanzhouensis) / Calyx 4-parted, lobes subequal; corolla lobes dark blue when dry (C. sinensis)" (Zhang & Tzvelev, 1998). However, after studying the types, we believe that more research is needed to establish their morphological and host differences. Ic. : a, Xin, 1992: 189, t. 73 f. 4-6; b, Peng & Wang, 1996: 94 t. 67 f. 1-3; c, Zhang & Tzvelev in Flora of China 18: f. 256-7 ["Opened calyx"]; frps.iplant.cn C.sinensis et FRPS 69: 88, t. 23 f. 6. 1990; d, photos PPBC id: 3609307 by 刘王锁 [Liu Wangsuo] 2017-05-14 in PPBC 31064, accessed Dec 2018 ["Corolla pale yellow, becoming dark blue when dry" (Zhang & Tzvelev, 1998)]; PPBC id: 1647977 by 朱强 [Zhu Qiang] 2007.5.10 in PPBC 45742, sub C. mongolica, accessed Mar 2019; PPBC id:4851283, sub C. deserticola by 王孜 [Wang Wei] 2017.7.6 in PPBC 31067, accessed Mar 2019). Distribution: China and Mongolia [unconfirmed]. "产内蒙古、甘肃和宁夏。 [Inner Mongolia, Gansu and Ningxia.] 常生于荒漠草原带及荒漠区的沙质地、砾石地或丘陵坡地，海拔1000-2240米。" (frps.iplant.cn C.sinensis); "Grasslands, slopes; 1000-2400 m. Gansu, Nei Mongol, Ningxia, NE Xinjiang" (Zhang & Tzvelev, 1998). Gansu / 甘肃省 / Kan-su / Kansu / Kan-suh: 1. "3845 / Kansou [Gansu / 甘肃省, Nord-China (China / 中华)] septentrional / Wei tschou [Lanzhou / Lan-Tcheou?] / 7-VI-1918 [leg. R.P. Licent]". – 2. "Cistanche sinensis n. sp. / 20.XII.1928 Beck [m. Beck] / R.P. Licent. — Chine Septentrionale. / Reçu le 24 Août 1922". – 3. "det.-rev. Ataei 05-2014" (P 02983456; rev. Ó. Sánchez Pedraja Sep 2016, holotype). 1. "Herbarium Kewense / Northern China / Nº 3845 / cis / Cystanche sp. / Wei tschou [Lanzhou / Lan-Tcheou?] / Kansou [Gansu / 甘肃省, Nord-China (China / 中华)] Septenl / 7.6.18 / Coll. Abbe E. Licent]". – 2. "Cistanche salsa (C.A. Mey.) G. Beck / Det. N. Ataei 2012.02.03". – 3. "isotype / of Cistanche sinensis Beck / in Engl., Pflanzenr. IV: 261 (Heft 96): 38 (1930)". – 4. "Molecular (DNA), Organ: Leaf, flower, DNA Bank number: 42129, Taken by: Crawford, Dept. : Herbarium, Date: 19.4.2012" (K 000852791; rev. Ó. Sánchez Pedraja Sep 2016, isotype); "Nord-China [China / 中华]: Kansu [Gansu / 甘肃省] septentrional, bei Wei tschou [Lanzhou / Lan-Tcheou? ], am 7. Juni 1918 (R. P. Licent n. 3845; in Herb. mus. Paris)" (Beck, 1930: 38); Gansu / 甘肃 / 1958.07 / 采集人/号 孔宪武 [Kong Xianwu] (WUK 0121243; rev. Ó. Sánchez Pedraja Mar 2019). Alxa League / 阿拉善盟: (HIMC 0034635; HIMC 0034636; HIMC 0034637; HIMC0034639). Ordos / 鄂尔多斯市: (HIMC 0034632; HIMC 0034633). Ulanqab / 乌兰察布市 / Улаанцав хот: (HIMC 0034647; HIMC 0034648). Xilin Gol League / Шилин-Гол / 锡林郭勒盟: (HIMC 0034640; HIMC 0034641; HIMC 0034642; HIMC 0034643; HIMC 0034644; HIMC 0034645; HIMC 0034646). "刘王锁 [Liu Wangsuo] 2017.5.14: 宁夏回族自治区石嘴山市 惠农区 石嘴山市 惠农区简泉农场 [Huinong District / 惠农区, Shizuishan / 石嘴山市]" (PPBC id:3609400, accessed Dec 2018 ["Corolla pale yellow, becoming dark blue when dry" (Zhang & Tzvelev, 1998)]). Shaanxi Province / 陕西省: "王孜 [Wang Wei] 2017.7.6 拍摄: 陕西省 榆林市 定边县 黄土高原 [Dingbian County / 定边县, Yulin / 榆林市]" (PPBC id:4851283, sub C. deserticola). Dornogovi Province / Дорноговь аймаг / Восточно-Гобийский аймак: "Cistanche feddeana Hao / Монголия, Восточно-Гобийский аймак Урген район [Örgön District] ... 5.VII.1975. N. 582b Собр. О.В. Журба [O.V. Zhurba]" (MW 0190449; rev. Ó. Sánchez Pedraja Mar 2019, see C. lanzhouensis); "Cistanche feddeana Hao / Монголия, Восточно-Гобийский аймак Урген район [Örgön District] ... 5.VII.1975. N. 582a Собр. О. В. Журба [O.V. Zhurba]" (MW 0190450; rev. Ó. Sánchez Pedraja Mar 2019, see C. lanzhouensis); "Cistanche feddeana Hao / Монголия, Монголия, Восточно-Гобийский аймак, 280 км на 10103 от г. Сайн-шанд [Сайншанд сум / Sainshand District] ... 22.VI.1980. Nº 5642 Собр. И.А. Губанов [I.A. Gubanov]" (MW 0190453; rev. Ó. Sánchez Pedraja May 2018, see C. lanzhouensis [corolla lobes pale brown-yellow when dry (Zhang & Tzvelev, 1998)]). Sükhbaatar Province / Сүхбаатар аймаг / Сухэ-Батор / Сухэ-Баторский аймак: "Cistanche feddeana Hao / ... Сухэ-Баторский аймак Баяндэлгэр сум [Bayandelger]... 5.VII.1975. N. 582 Собр. О. В. Журба [O.V. Zhurba]" (MW 0190448; rev. Ó. Sánchez Pedraja Mar 2019, see C. lanzhouensis). Chinese Virture Herbarium (CVH). 2004-2013. Orobanchaceae. Cistanche sinensis. URL: http://www.cvh.ac.cn/ - http://www.cvh.ac.cn/en - http://www.cvh.ac.cn/cnpc/Cistanche%20sinensis - http://www.cvh.ac.cn/splatin/27798 (accessed Sep 2016). FloraGREIF - Virtual Flora of Mongolia. Virtual Guide to the Flora of Mongolia - Plant Database as Practica Approach. Cistanche. [Search Plant Database]. University of Greifswald, Institute of Botany and Landscape Ecology, Institute of Geography and Geology, Computer Centre, 2010- (continuously updated). Computer Centre of University of Greifswald, D-17487 Greifswald, Germany (accessed Mar 2019). GBIF (The Global Biodiversity Information Facility). GBIF Online Resource Centre. Search. Cistanche sinensis. URL: https://www.gbif.org/species/3730567 (accessed Mar 2019). Hao, K. S. 1934. Plantae novae Sinicae. I. Repert. Spec. Nov. Regni Veg. 36: 222-224. K (Kew). Royal Botanic Gardens. 2002. Kew Databases - Herbarium catalogue - ePIC [electronic Plant Information Centre] - [searchpage IK]. 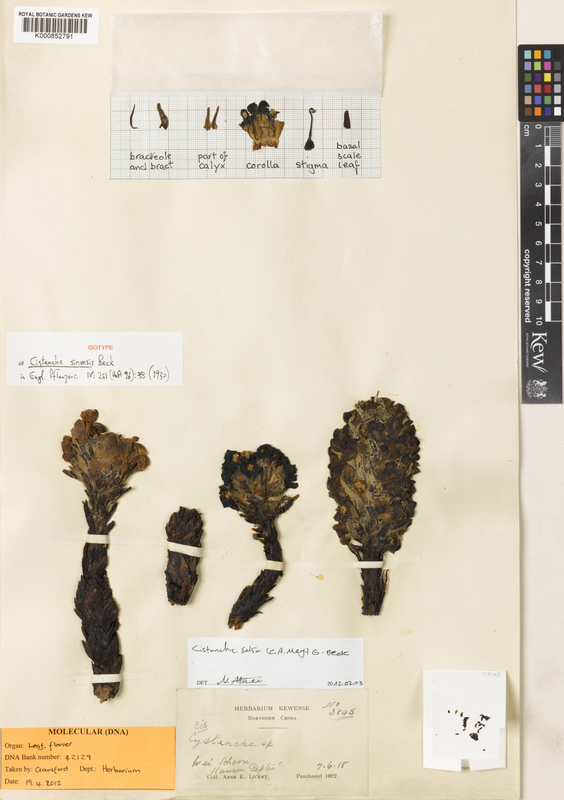 URL: http://www.kew.org/epic/ - http://specimens.kew.org/herbarium/K000852791 (accessed Sep 2016). MNHN (Muséum National d'Histoire Naturelle). Vascular plants (P). Orobanchaceae. URL: https://science.mnhn.fr/all/search - https://science.mnhn.fr/institution/mnhn/collection/p/item/search - http://coldb.mnhn.fr/catalognumber/mnhn/p/p02983456 [permalink]... - https://science.mnhn.fr/institution/mnhn/collection/p/item/p02983456 [browser link]... - http://mediaphoto.mnhn.fr/media/1441353062510nsYWJ5HRFzNsR44p [image link]... (accessed Sep 2016). NSII. Virtual Museum. URL: http://www.cfh.ac.cn/NSII/VirtualMuseum.html (accessed Mar 2019). PPBC, Plant Photo Bank of China [中国植物图像库]. 2008+. 系统与进化植物学国家重点实验室-中国科学院植物研究所 [State Key Laboratory of Systematic and Evolutionary Botany (LSEB) - Institute of Botany, Chinese Academy of Sciences (CAS)]. URL: http://ppbc.iplant.cn/ (accessed Oct. 2013). Xin, L.Y. [liu ying xin]. 1992. zhong guo sha mo zhi wu zhi [Flora in desertis Reipublicae Populorum Sinarum 3] (Chinese). Zhang, Z.Y. & Tzvelev, N.N. 1998. Orobanchaceae. Cistanche. Cistanche sinensis. In: Flora of China 18: 229-243. URL: http://www.efloras.org/florataxon.aspx?flora_id=2&taxon_id=200021457 (accessed Aug 2009).